I thought we would start this blog with a simple visual goatie test. Can you spot the odd one out in the following photo of the milking parlour taken early this morning? Yes, indeed. Well done everyone. There would seem to be someone facing the wrong direction. 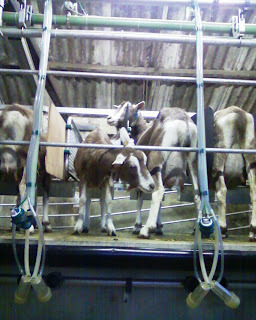 You may remember that I said the goats were starting to get naughty as they became more used to the parlour. This is one of the things that small naughty goats have discovered is quite fun to do. 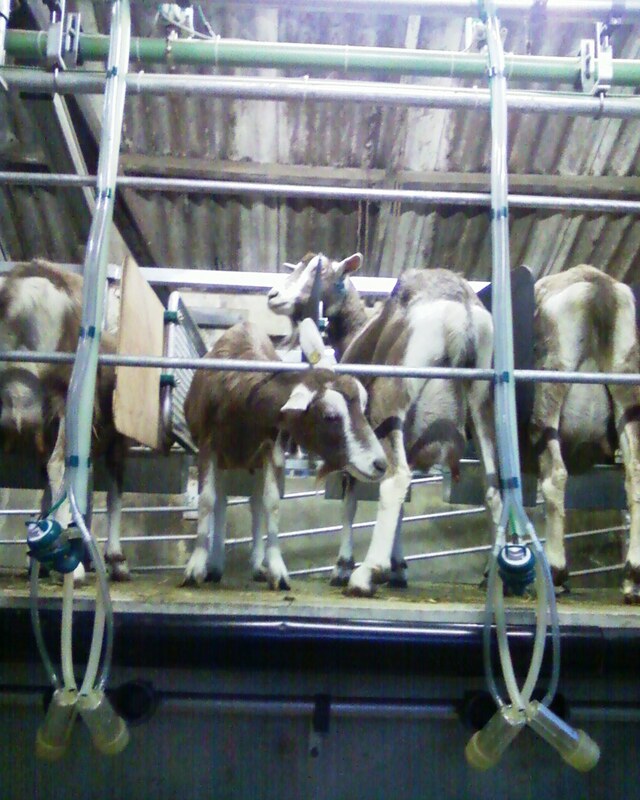 When they have finished their food, annoyed the goats on either side by grabbing their ears and exhausted all the possibilities for naughtiness in one direction, some of the youngsters are small enough that they can turn themselves round in the stall and face the opposite direction while they are waiting for the larger goats with more milk to finish. This is always good fun as you can watch the humans and have a nibble on all those lovely milking pipes hanging down from the ceiling. Great fun! Well, we survived the visit from London Farmers Markets on Tuesday. Having met Cheryl at Ashford station around 11am, I then spent the rest of the day showing her around the goats and the various places where we make the cheese. There was also a fair bit of paperwork to go through, so we adjourned to Macknade Fine Foods in Faversham for lunch in their newly extended cafe. Very pleasant it was too! I have to say that I have been very impressed with the LFM organisation so far – they are extremely thorough in checking out their stallholders. When I visited Balham market a couple of weeks ago, I also found the market manager to be very professional – he was meeting shoppers at the gate, had lots of information laid out for people to read and take home and, according to Cheryl, will also happily take food samples off your stall and walk around the market with them handing them out to shoppers. Anyhow, hopefully we passed our test and I am certainly being allowed to attend Balham Market this Saturday, so it’s all systems go! It will mean an early start for me and I will almost certainly have to leave David finishing off the goats so that I have plenty of time to navigate the traffic and set up the stall in advance of the 9am market opening. I expect it will be pouring with rain – nothing quite like struggling with a gazebo in the rain! On the cheesemaking front, it’s been another busy week. Made the usual batch of Ellies on Monday, cow’s milk Brie and Camembert for Cheesemakers of Canterbury on Wednesday and have a small batch of Fremlin’s Kentish Log sitting in the cheese vat today, ready for draining and moulding over the weekend. 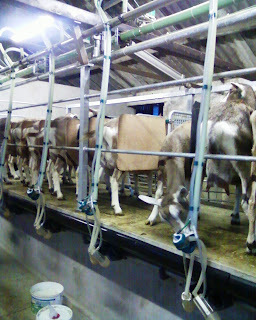 Then Ellies again on Monday and milk to Dargate on Thursday for Kelly’s Canterbury Goat hard cheese. This time of year, the milk starts to drop off quite considerably and, with a growing number of bottled milk orders, we struggle to keep up with demand. We have to try and educate everyone that goat’s cheese is a seasonal product and, just because you can get it from a supermarket all year round, it doesn’t mean that Ellie’s Dairy has mountains of it all the time! It can take careful marketing ... keep enough going for everyone to have a little and look forward to the spring when supplies of milk rocket as all the new milkers come on stream! Good luck for Saturday Debbie. I'd like to visit Balham and say hello but its Grand-daughter's first birthday party on Saturday and consequences dire if we miss the event (anyway, David's looking forward to his jelly and ice cream)! Thanks Sue! Went pretty well - see next blog!